I first qualified for the Marathon Maniacs in 2006, but at that time I didn’t know that the club existed. 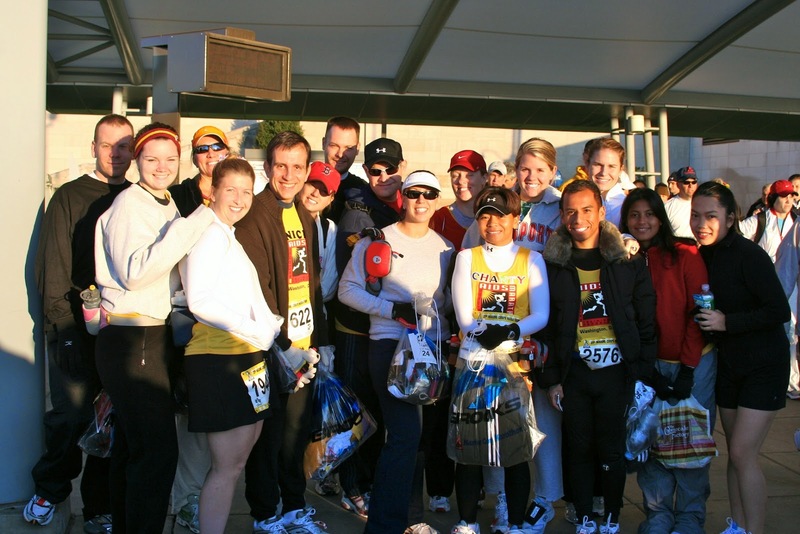 Marathon Maniacs is a club for people who run a lot of marathons in a short period of time. And the way I qualified was to run the Columbus Marathon on one Sunday, then run the Marine Corps Marathon the following Sunday, qualifying at the Bronze or One-Star level by running two marathons in 16 days. I officially joined the club in 2011 once I knew about it. I had been out of the distance running world for a few years. Initially it was due to injury, and then because it had become habit to only run shorter events like 5Ks. But in 2006, those were two special marathons for me, and they were intertwined from the onset. You see, I had already run two marathons, but my dad had not been able to see me complete either of them. He was very sick with stage 4 cancer at the time, so traveling was out of the question for him. I thought that if I ran my hometown race in Columbus, he might be able to come out to the marathon course or the finish line. At the very least, he’d be at home when I showed up with my medal and my stories. So I decided to run in Columbus, but I was living in Arlington VA and wanted a local group to train with. I chose to sign up with the National AIDS Marathon Training Program for the 3rd time. I had run New Orleans and Dublin with them. Even though I would need to start fundraising again, it was for a worthy charity, and I knew they had a great training program. 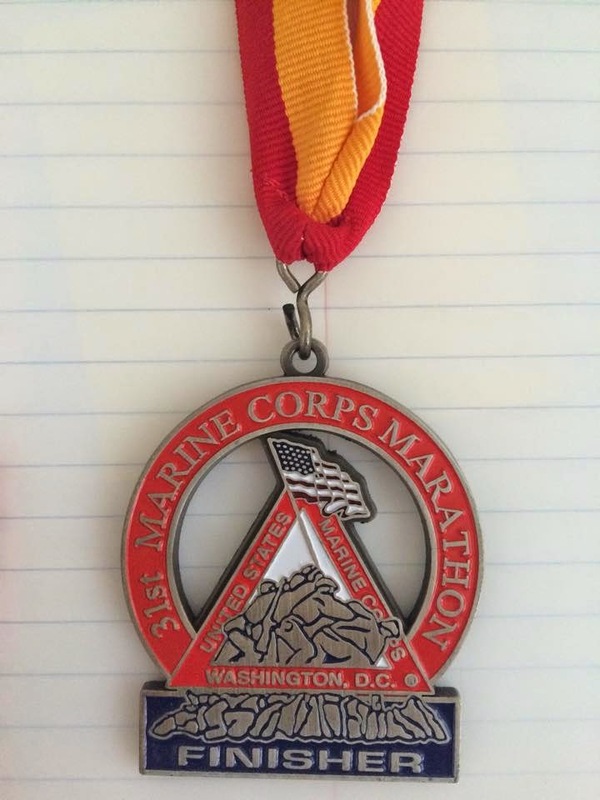 So I signed up for their Marine Corps Marathon (MCM) program. Since MCM was one week after Columbus, the training schedule was perfect. I would get a charity entry into the MCM, but I never intended to run it. Columbus was my goal race, and conventional wisdom said it was foolish to run a marathon the week after another marathon (I know…look at me now, kids!). Because I had now been running for more than a year, my third time trial placed me into a faster pace group than with either of my two previous marathons. So, I started training. As our long runs got longer, my dad got sicker. And then we lost him. He died on July 1, 2006 when I was back in Columbus to run a 4th of July race. That Columbus race was on July 2, was a 4-Miler, and I ran it anyway. I ran it for my dad. It was the most emotional race I ever ran. And I was resolved to continue my training for Columbus, and run it in my dad’s honor. During training I developed a horrible case of plantar fasciitis, but I would not quit. My podiatrist gave me cortisone injections to treat the foot, or at least to mask the pain so that I could run. The doctor was a marathoner too, and understood my drive to complete this race even with an injury. So, Columbus Marathon day came, and I ran a new PR, taking about a half hour off my time in the Dublin marathon. I ran for my dad. I ran in my hometown. I had the most number of spectators ever. My aunt Debbie and her husband Ken met me at a couple different points on the course in Upper Arlington, where the miles seemed long and boring. It was great to see them there. My stepmom Kim came out with my grandmother Ann and her friend John, and I found them in the last few turns of the race downtown. Near them were my friends Nikki and Shelly. I think my friend Pete was there too. My brother Zack was waiting for me at the finish line. I finished my fastest marathon to-date and collected my medal. My foot was in pain, but it was manageable. I thanked my dad. A few days later, it was time for the Marine Corps Marathon race expo at the DC Armory. I had no intention of running. Who would run two marathons on back-to-back weekends, let alone run them with plantar fasciitis? But I went to the expo anyway. I picked up the race bib and was funneled through the line to get my timing chip. I didn’t need a chip, since I was not going to run. But I picked it up anyway. Then I picked up my shirt. I bought a pair of MCM-branded Brooks running gloves and a water bottle that I still have today. And then I went to a booth and purchased a foot wrap for plantar fasciitis. Why did I do these things if I wasn’t going to run? The night before MCM, my AIDS Marathon team met for a pre-race meal at someone’s house, and part of the festivities were to decorate our team singlets. I went to the party even though I had no intention of running. I wanted to celebrate with my group and wish them well. Well, you already know how the story goes. I did run the MCM that next morning. I'm not a morning person, but I got up early, put on my running clothes, bib and chip, and met my team at the East Falls Church Metro at the designated time. They were surprised to see me. My foot hurt. I was happy to be there, and ready to do my best that day. And so, I set out with some members of my pace team, wearing the yellow AIDS Marathon singlet – for the third time. I didn’t stay with anyone I knew for long, so I was mostly alone during the marathon. Well…at a race as big as MCM, I wasn’t exactly alone. I ran with several thousand of my closest friends. I ran the Spout Run Parkway, the Key Bridge, the Rock Creek Parkway, Hains Point and the monuments. I ran the 14th Street Bridge (and beat it) before my injured foot just didn’t want to go any farther. In Crystal City, I started walking a lot. It hurt to run or to walk. Any sane person would just have stopped. I kept going. We passed the Pentagon, and I knew it wasn’t much farther. I made it to the hill at the Iwo Jima Memorial. I cannot remember just how bad my foot was and whether or not I ran or walked up that hill, but I made it to the finish line. I collected my medal. I thanked my dad again. And I hobbled back to the Metro to retrieve my car. I was quite proud to show up at work the next morning with my medal. The coworkers were surprised to learn that I ran the marathon, knowing that I had just run Columbus and that I was injured. Maybe it wasn’t wise, but I was glad I did it. My time was slower than in Columbus, and slower than in Dublin the year before, but that didn’t matter. I gave my foot a few weeks to rest and then decided maybe I shouldn’t run another marathon right away…so instead I ran the St. Jude Memphis Half Marathon a little more than a month later. 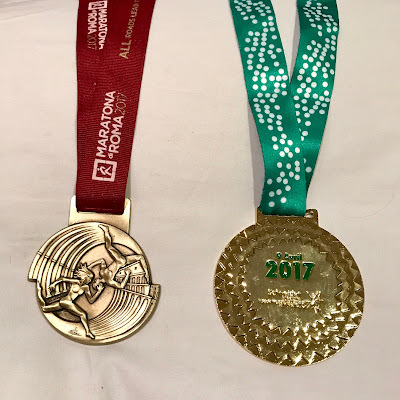 I had run four full marathons, but that was my first half marathon. And THEN, after THAT race, I finally decided to let my foot heal. I would find out later…I was indeed a Marathon Maniac. I haven't run Columbus since that first time, and I don't know if I will. There are other Ohio marathons that are higher priorities for me. I will return to MCM this October. It will only be my second MCM, although I've run the 10K three times and have spectated other times. Every time I think of the Columbus Marathon, I think of my dad. I wonder what he would think of my Marathon Maniac membership and Titanium status. I think he would be proud.